The solution is simple to change the desktop theme eg Windows Design in Windows-10, this solution is also for Windows 8.1 and Windows 7!! or run the command: control.exe /name Microsoft.Personalization from the Windows-10 Run Dialog and change the Windows 10 Theme! (... see Image-1 Arrow 1 to 4). At this point you can change the Windows 10 Desktop Background or Windows-10 System Sounds. See also: Customize icon spacing on the windows 10 desktop (symbol distances)! 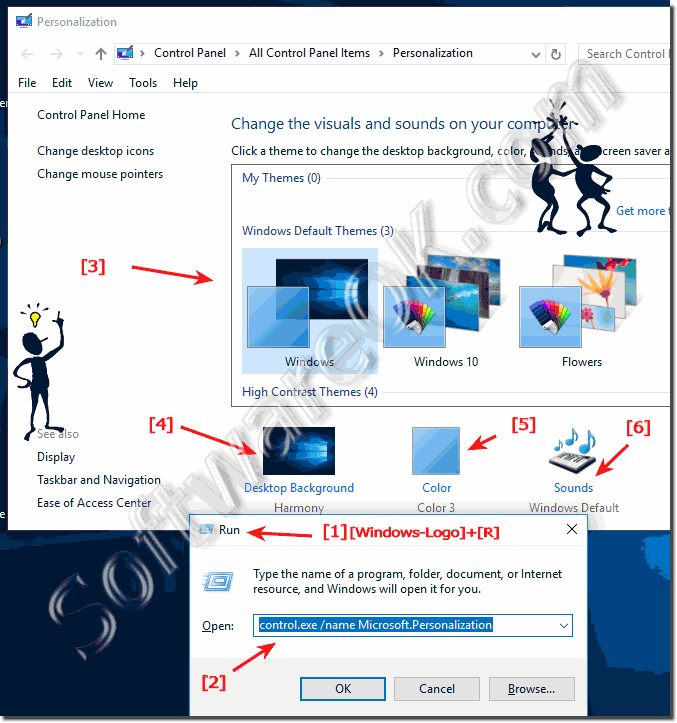 (Image-1) Change the desktop theme and background in Windows-10! If your Windows-10 computer is working slowly, you might see a message saying that the theme is using most of its allowed memory. If this happens, you can change to the Windows 10 Basic theme or a high-contrast theme to improve performance. If you change the theme to Windows 10 Basic, you will no longer get the full Aero experience. Aero is the premium visual experience in this version of Windows 10. It features a transparent glass design, window animations, Aero Flip 3D, and live window previews. ... change Home Folder in Windows 10 MS-Explorer (to My Computer, This PC)! ... where to find Experience Index, PC rating in Windows-10? Auto Run a program when Windows-10 starts, how to? Open the location of a Program in Windows-10 (path, folder)? How to change desktop theme in windows 10? Change desktop theme windows 10 Home and Pro? Find and customice the desktop theme for new windows 10 x64?